Sayed Haider Raza's early themes were drawn from his memories of a childhood spent in the forests of his native village of Barbaria, in Madhya Pradesh. 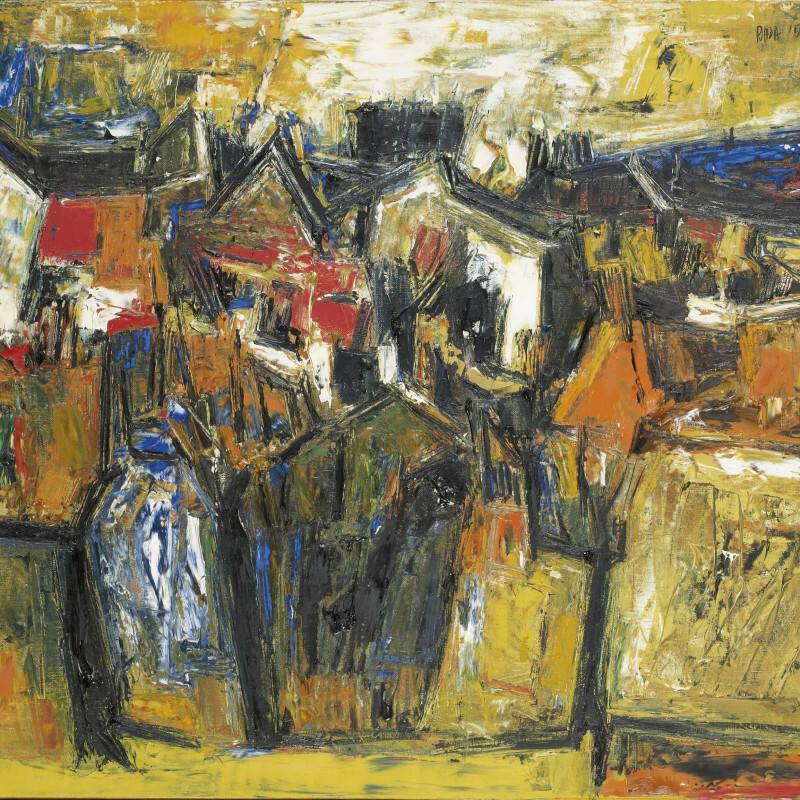 Raza's style has evolved over the years - he began with expressionist landscapes, which became rigid, geometric representations of French towns and villages in the early 1950s, following his move to Paris. Later, the lines blurred and colour began to dominate; his theme was still landscape but it was now non-representational, speaking to the sentiment evoked by a place rather than its tangible aspects. In the late 1970′ s, the artist's focus turned to pure geometrical forms; his images were improvisations on an essential theme: that of the mapping out of a metaphorical space in the mind. The circle or "Bindu" now became more of an icon, sacred in its symbolism, and placed his work in an Indian context. The artist calls his recent work a "result of two parallel enquiries". Firstly, it is aimed at a "pure plastic order" and secondly, it concerns the theme of nature. Both converge into a single point and become inseparable - the 'Bindu' (the dot or the epicentre). "The Bindu symbolizes the seed, bearing the potential of all life." Raza was one of the founders of the Progressive Artist's Group, along with K.H. Ara and F.N. Souza. After receiving a French Government Scholarship in 1950 he left for Ecole Nationale des Beaux Arts, Paris. Raza was awarded the Prix de la Critique in Paris in 1956. In 1962 he served as a visiting lecturer at the University of California in Berkeley, USA. He has participated in numerous exhibitions, including the Sao Paulo Biennale in 1958, the Biennale de Menton, in France in 1966, 1968 and in 1978, and Contemporary Indian Painting, at the Royal Academy in London, in 1982. He was conferred the Padma Shree Award by the President of India in 1981, and the Padma Bhushan in 2007. Raza passed away in Delhi in 2016 shortly after the publication of the first volume of the catalogue raissone of his work produced between 1958-1971.